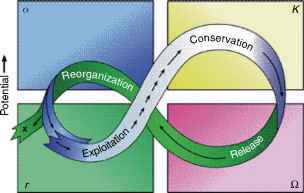 The stages described above can be illustrated by the well-known four-box model of the 'resilience alliance', which has been depicted in Figure 1. The axes show the connectedness versus the potential for development. 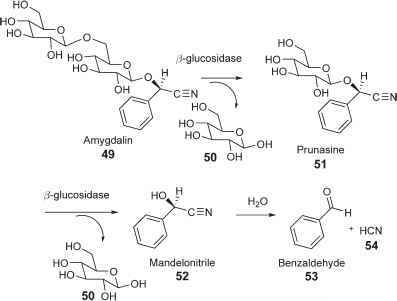 Notice that the nutrients as well as the energetic resources do not grow after the release, but get eroded or leached, and the change of their availability is due to the activities of the organisms which appear right after the reset of the pioneer stage. Figure 1 Adaptive cycle after Holling. Figure 2 Ecosystem succession as a function of structural and functional items. Figure 3 Developmental opportunities during the cycle from Figure 1. The described sequence has been illustrated differently in Figure 2, namely as a function of the system's internal connectedness and the stored exergy, while the basic idea of Holling's cycle has been maintained. Starting with the exploitation function, there is a slow development. The trajectory demonstrates a steady increase in mutual interactions as well as an increase in the stored exergy. As has been described above, this energetic fraction can be distinguished into a material fraction (e.g., biomass, symbolizing the growth conception) and the specific exergy which refers to a complexification of the system's structure (development after Ulanowicz). The long-term development shows a steady increase up to the mature state. 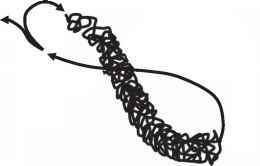 Here the maximum connectivity can be found, which on the one hand is a product of the system's orientation, but which also is correlated with the risk of missing adaptability, which can be described as overconnectedness. After the fast releasing event, the short-term conditions determine the further trajectory of the system. It might turn into a similar trajectory or find a very different pathway. Figure 4 Holling's stages are expressed in terms of biomass and specific exergy. 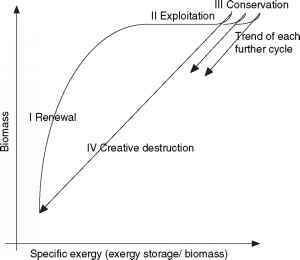 Notice that the trend of each further cycle is toward higher exergy storage (more growth in one or more of the three growth forms). Holling's cycle is plotting specific exergy versus biomass. 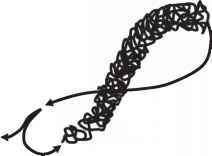 As seen on this illustration every new cycle makes it possible to move further and further away from thermodynamic equilibrium. There is a certain probability that the new sexual recombinations and mutations which can be tested in the reorganization phase due to the provision of inorganic nutrients in the breakdown phase offer a better utilization of the resources.